This is a dense, moist, and flavorful cake, and it's delicious with a simple glaze. Or finish the cake with a dusting of powdered sugar. See the tips below the recipe for an easy vanilla glaze or cream cheese glaze. It's a nice change of pace from zucchini bread or muffins. If you have loads of zucchini, shred it and freeze it in 1 or 2-cup portions. 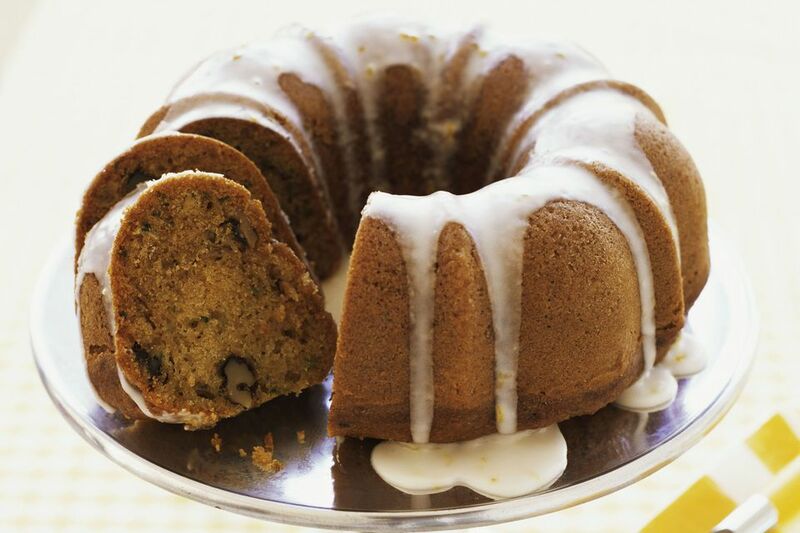 You can have zucchini bread and cakes all year round. Wrap and freeze leftover slices of cake for 3 to 4 months. Generously grease and flour a 10- to 12-cup bundt cake pan. Get all the nooks and crannies. In a bowl, combine the flour, oats, baking powder, soda, salt, and spices; set aside. In a large mixing bowl with an electric mixer, cream the butter and brown sugar until light and fluffy. Beat in the eggs, one at a time, beating well after each addition. Add the vanilla and blend well. Slowly beat in the dry ingredients, alternating with the buttermilk and ending with the dry ingredients. Stir in shredded zucchini and nuts. Bake the cake for 65 to 75 minutes, or until golden brown and a cake tester or toothpick inserted in center comes out clean. Cool on a rack for 10 minutes; invert onto a serving plate to cool completely. Drizzle a glaze over the cake (see below) or dust with powdered sugar. Simple Vanilla Glaze - Combine 2 cups of sifted powdered sugar with 4 tablespoons of melted butter and 2 tablespoons of milk or hot water. Stir in 1 1/2 teaspoons of vanilla. Beat until smooth, adding more milk or water, as needed. Drizzle over the cooled zucchini cake. Cream Cheese Glaze - Beat 4 ounces of cream cheese with 2 tablespoons of softened butter. Add 2 cups of powdered sugar and beat until smooth. Beat in 2 tablespoons of milk, water, or juice and 1 teaspoon of vanilla extract. Add more milk, water, or juice until a good drizzling consistency is reached.